Where is the E-Cigarette & Vaporizer market heading? If you are involved in this sector you must read this brand new report. 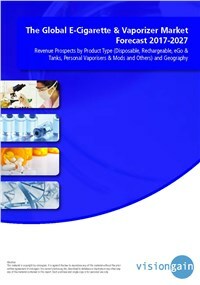 This report shows you the potential revenues streams to 2027, assessing data, trends, opportunities and business prospects there. Our 197-page report provides 99 tables, charts, and graphs. Read on to discover the most lucrative areas in the industry and the future market prospects. Our new study lets you assess forecasted sales at overall world market and regional level. See financial results, trends, opportunities, and revenue predictions. Much opportunity remains in this growing market. See how to exploit the opportunities. In addition to revenue forecasting to 2027, our new study provides you with an overview of the regulatory landscape, recent results, growth rates, and discussion of the factors driving and restraining the market. The report also includes profiles for some of the leading companies in the E-Cigarette and Vaporizer market. There will be growth in both established and in developing countries. Our analyses show that the developing markets, China and India in particular, will continue to achieve high revenue growth to 2027. Developments worldwide in e-cigarette regulation, especially in the US and Europe will influence the market. Overall world revenue for E-Cigarette and Vaporizer market. will surpass $9.5bn in 2017, our work calculates. We predict strong revenue growth through to 2027. The increasing sophistication of E-Cigarettes, reduction in cost as compared to conventional cigarettes and increasing awareness of E-cigarettes as an alternative to tobacco smoking will all lead to growth in the market.